Flooring retailer's stock sent reeling by announcement its CEO abruptly quit. With all the shoes falling at Lumber Liquidators (NYSE:LL), it's no wonder investors are putting on their own footwear and running for the exits. Lumber Liquidators dropped 16.5% Thursday. The latest bit of shoe leather to fall out of the sky onto the flooring specialist is the abrupt resignation this morning of CEO Robert Lynch. In a rather tersely worded statement offering no explanation -- not even the well-worn excuse that it's "for personal reasons" -- Lumber Liquidators announced that Lynch quit and company founder Thomas Sullivan was stepping into the role on an interim basis as a search for a replacement was initiated. Aside from the chaos such sudden departures bring, it's a worrisome development because the flooring specialist is under particularly intense regulatory and legal scrutiny over the health risks posed by its laminate flooring as well as whether it improperly imported wood. Equally distressing for investors is that the CEO's resignation comes less than a month after the company announced CFO Daniel Terrell would be leaving. The brain drain and loss of talent at the top calls into question just how effectively Lumber Liquidators can get beyond the multiple crises as the surface is only just now getting scratched on what the problem is. Initially, the questions about its China-sourced laminates was seen as manageable despite the collapse in Lumber Liquidators' stock. Activists, short-sellers, and critics charged the flooring retailer with selling laminate floors that exceed regulatory limits on exposure to formaldehyde, which is used in the manufacture of the flooring. Based on their tests, the exposure levels were excessive. Lumber Liquidators seemed to effectively parry their allegations, though, by strongly defending its products and criticizing the way the tests were performed because they changed the nature of the flooring rather than testing it based on how it performed in the home. When the Consumer Product Safety Commission said it would test the flooring, too, and would do so using methods backed by Lumber Liquidators, it seemed the retailer would ultimately be vindicated. Others had also independently verified Lumber Liquidators' claims, so it looked to be just a matter of time before the squall would blow over. But one of the troubling aspects of the 60 Minutes segment that aired the allegations against Lumber Liquidators was the seeming admission by its Chinese suppliers that they knew the product they were shipping to the company was not in compliance with regulations. Even company founder Sullivan said it would be troubling if true. But as I wrote at the time, "Is that evidence of criminality, artful editing, or a misunderstanding? That still needs to be sorted out." Unfortunately, Lumber Liquidators hasn't done itself any favors with the way it's responded to the growing scandal. Even though it had advance knowledge the news program was airing the critical segment, the flooring specialist took 11 days to formally respond to it, a week and a half during which speculation and negative commentary ran rampant and unchecked. No wonder the company's sales that month were bludgeoned. Consumers were running scared on unchallenged allegations. But Lumber Liquidators did it again just recently when, a full three months after its first warning to investors that there was something amiss, it suspended sales from its Chinese suppliers. There had been plenty of time before any of this blew up to know whether it should stop selling that product. To wait as long as it did only ensured the magnitude of the problem would grow. Then, of course, there was the abrupt resignation of the CFO, who is on the job until June 1, and now the CEO has exited the building. Although 60 Minutes and the other critics of the company never alleged Lumber Liquidators was aware of what its Chinese suppliers were doing, the sudden departures of two top executives might make people wonder. And don't forget the Justice Department probe. It has been looking into whether Lumber Liquidators knew or should have known it was violating the Lacey Act by illegally importing wood products from Russian forests that are home to the Siberian tiger. Investors are wondering whether the abrupt resignations a sign there is fire beneath all the smoke. 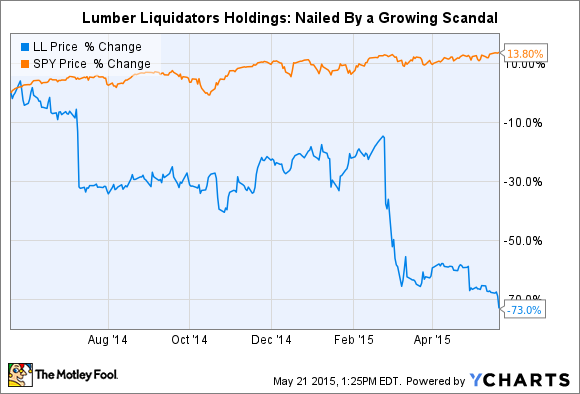 Lumber Liquidators stock has been repeatedly hammered. Shares have lost more than two-thirds of their value since the first hints were given back in February. Since hitting a new 52-week high almost exactly a year ago, Lumber Liquidators stock now sits 75% below that level. Investors, it seems, are no longer sticking around to see what shoe may fall next.